HOUSTON (AP) — Terrel Hunt scrambled 12 yards for a touchdown with 1:14 remaining to lift Syracuse to a 21-17 win over Minnesota in the Texas Bowl on Friday night. Brisly Estime set up Hunt’s touchdown with a 70-yard punt return. Estime would have scored if not for a tackle by punter Peter Mortell. 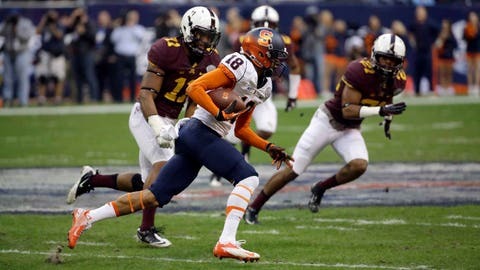 It was the second-longest punt return in Texas Bowl history. Syracuse attempted a 45-yard field goal with about 3 minutes left, but it sailed wide right. Robert Welsh sacked Leidner on third down on the next drive to force a punt and set up the winning drive.